I had a friend with a BluRay drive extract the audio from my copy of a concert BluRay disc into AC3 files which he returned to me, but now I'm not sure what the best way would be to convert those AC3 files into AAC files. I've read that it's not possible to go directly from AC3->AAC, but instead have to use WAV as an intermediary; AC3->WAV->AAC. I can probably figure out how to do this, but why should I be the one to make two steps? Is there software already available (free preferred, but not required) that will simply let me plug in an AC3 file and get an AAC equivalent out? When I say AAC equivalent, that means identical channel setup to the source AC3 files by default, but perhaps also preferences to constrain it to 2 channel or anything else I'd like. I've already tried using Handbrake and Max to no avail. VideoLAN can do this. Select "Streaming/Transcoding Wizard" from the File menu. Choose "Transcode/Save to file". On the next page click "Choose" and open your AC3 file. 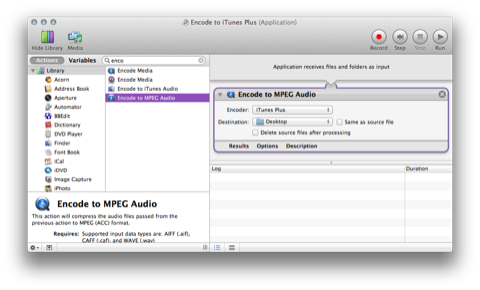 On the next page tick "Transcode audio" and choose "MPEG 4 Audio" and choose the desired bitrate. Click "Next", choose "MPEG 4 / MP4", click "Next" again and "Choose..." where to save the file. "Next" and "Finish". The file VideoLAN creates has the extension .mp4, change it to .m4a and there you go. I was playing with this problem today and while I didn't find a batch process solution, I did learn something that may me useful to others faced with this problem. If you install the Perian QuickTime components, QuickTime Player X will open and play AC3 files. Unfortunately, it will not export them. However, if you use QuickTime Player 7 Pro (again, with Perian installed) you can export an AC3 file into an AIFF or WAV format. Once you have the file saved in one of those formats, it is trivial to create an Automator Droplet (or service) to convert the files into an AAC/MP4 format. The Audacity 1.3 beta claims to import AC3 files and will export M4A/AAC so long as the ffmpeg libraries are installed. I can tell you the software opens cleanly and imports an AAC file, but I have no AC3 files with which to test it. It's not pretty, but if you'd prefer a GUI app, Audio Converter should do what you need. It's 99¢ on the App Store, or free from their site. Format Factory: it supports converting AC3 to AAC and is free. VideoLAN: this tool is free too and I can use it to convert AC3 to AAC. Just follow the guide Max Ried offered. A useful step by step guide: this guide tells us how to convert AC3 to AAC, MP3, WAV, etc. Hope the above all will help you more or less. Not the answer you're looking for? Browse other questions tagged software-recommendation audio .